Humans have used symmetrical patterns for thousands of years in both functional and decorative ways. Now, a new book by three mathematicians offers both math experts and enthusiasts a new way to understand symmetry and a fresh way to see the world. 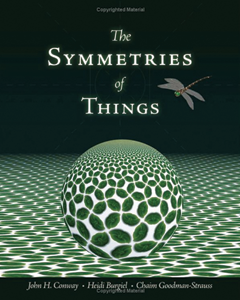 In The Symmetries of Things, eminent Princeton mathematician John H. Conway teams up with Chaim Goodman-Strauss of the University of Arkansas and Heidi Burgiel of Bridgewater State College to present a comprehensive mathematical theory of symmetry in a richly illustrated volume. The book is designed to speak to those with an interest in math, artists, working mathematicians and researchers. Symmetrical objects and patterns are everywhere. In nature, there are flowers composed of repeating shapes that rotate around a central point. Architects trim buildings with friezes that repeat design elements over and over. Symmetries of Things contributes a new system of notation or descriptive categories for symmetrical patterns and a host of new proofs. The first section of the book is written to be accessible to a general reader with an interest in the subject. Sections two and three are aimed at mathematicians and experts in the field.